Remy Millott, CEO of Pinmar parent company GYG, explains why a new lick of paint is an essential part of any major refit. There’s an important distinction to be made between cost and value when evaluating the repainting of a superyacht. Yes, on the one hand, repainting represents a substantial expense in the refit budget but, on the other, it contributes to the preservation of both the performance and value of the vessel. In my 30 years’ experience in the industry I’ve seen many owners and captains maintain meticulous painting schedules while others regularly postpone paint works. There are no prizes for guessing which approach I would recommend. Paint provides an essential layer of protection to the fairing and substrate from the corrosive effects of the sea, sun and air-born pollutants. Superyacht paint manufacturers have carried out extensive testing of their products to identify how long a paint system will maintain its protective performance if applied and maintained correctly. For coatings above the waterline this is typically four to five years, but this clearly depends on the cruising and usage pattern of the vessel. The longer the paint system remains in place, the more it will degrade until the point of failure when corrosive damage to the underlying fairing and metal substrate will commence. If left untreated, the damage will increase to the point where it will threaten the integrity of the structure. When a repaint has been substantially delayed beyond the integrity of the paint system, the process becomes much more complex and the costs and risks increase significantly. The expense and time required to repair a failed paint system can be considerable because it will require additional corrosion treatment, high-build epoxy primers and, in extreme cases, a full system repair. This will far exceed the cost of a regular repainting programme. One important aspect of repainting a superyacht that is sometimes overlooked is the maintenance and upkeep of the hardware, fixtures and fittings situated on the exterior of the vessel. During a repaint, these pieces are removed, serviced and even replaced, ensuring items such as hydraulic and mechanical doors work properly. Caulking lines are removed so that water does not get through to the interior or seep under the teak margin planks. There are alternatives available in the market today that purport to extend the life of the paint system or at least mask the appearance of fading paint. Ceramic coatings that were developed largely for the white-goods industry are being offered as a potential solution to preserve a high-gloss appearance and extend the life of the paint system for a further one to two years. While these products do provide some interim protection to the paint system, they present complications when the yacht has to be repainted due to their chemical nature. There are further considerations, including the potential damage to the underlying paint system caused by their application, and the coating can also be difficult to remove prior to carrying out the eventual repaint. 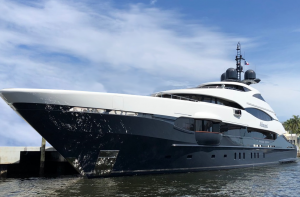 In a recent independent report on ceramic coatings written by superyacht industry coating expect Ken Hickling, he commented on the lack of research and information available on the potential damage to the underlying paint primers and fairing from the acid-based removal products on offer. Vinyl wrapping is another product available to maintain the image of the hull or superstructure when paintwork has been deferred, but the finish is not comparable with a high-gloss topcoat and, again, there is a lack of published information on the impact of the adhesives and removal solutions on the underlying paintwork. The reality is that a paint system correctly applied and maintained in accordance with the manufacturer’s technical specification offers the best protection and appearance. The industry is highly competitive and if a manufacturer was able to develop a product that offered a longer in-service period they would gain substantial market share and a major return on their R&D investment. However, for now, it’s a renewal cycle of between four to five years. Finally, it is important to highlight that GYG has invested substantial time, money and resources into the R&D of its application process and, as a result, we are able to paint ever-larger yachts within the same time frames and relative cost parameters as we were five years ago.